Rose Hall is one of the most popular tourist attractions in Jamaica, located high above Montego Bay. 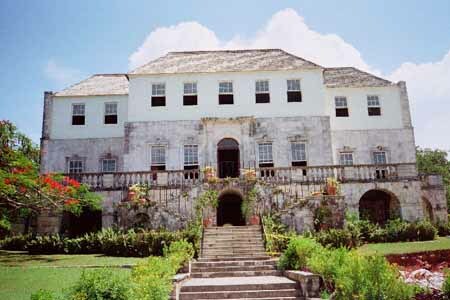 Rose Hall is now considered to be Jamaica's most haunted building, and has recently been visited by American TV's Ghost Hunters paranormal team. The Georgian Mansion was built in the 1770's for the Palmer family who made their fortune in sugar. The mansion was host to many parties for the high society of colonial Jamaica, whilst the slaves toiled in the Palmer's fields. Rose Hall is famous for the story of its former infamous mistress Annie Palmer, who came here in 1820, as the teen bride of John Rose Palmer. Annie's parents were missionaries in Haiti, which is where she was raised. Annie spent a lot of her time with a native Haitian voodoo priestess who is said to have taught her the black arts. Annie Palmer was a hard woman to satisfy, even though Rose Hall was a lucrative sugar plantation with an abundance of more than 2,000 slaves (which was considered a sign of great wealth), Annie still felt the need to turn to black magic voodoo. Annie was said to have murdered three husbands because they were not to her liking. Annie claimed that they had suffered from mortal illnesses, and always quarantined their bodies. Annie would later had them carried out and buried by slaves, who disappeared afterward, it is believed that she had the slaves killed so they couldn't tell anyone about the true cause of death. One of the most widely-held beliefs is the certainty that Annie enjoyed torturing her slaves. She had a small second-story balcony on the rear of the house, where she would stand and watch slaves being beaten or whipped, often to death. Naturally, the slaves were terrified of her and wished to be free from her. One story tells of a servant girl who tried to poison her. The attempt was unsuccessful. Annie had the servant tried and executed, but requested that the girl's head be returned to her. She kept the head on a stick outside as a warning to the other slaves. The most complete account of life at Rose Hall comes from the journal of a young book-keeper who was sent to work at the plantation to learn the process before taking over one of his father's plantations. This young man was much admired by Annie, who desired to take him as her lover. Unfortunately for her, the bookkeeper fell in love with a servant who cleaned his house. When Annie learned why the bookkeeper discouraged her advances, she became very angry and put a curse on the servant girl. The servant girl was terrified and told her uncle about the curse. Her uncle practiced the white magic side of voodoo, but was not powerful enough to lift the curse. The young servant girl died soon after from a mystery illness. Her uncle was very upset and held a meeting with a group of Annie's slaves. One night, the group (led by the uncle) raided the house, they found Annie in her bedroom and killed her. The young bookkeeper heard of the plot and went along, trying to stop the slaves before they killed Annie, but he was unsuccessful. Afterward, the slaves burned some of Annie's belongings particularly her paintings. They were careful not to burn everything, and not to destroy the entire house because they were afraid that Annie's spirit would put a curse on all of them, although damaged, Rose Hall remained standing. After her death, Annie's slaves refused to bury her. Annie's neighbours eventually ordered their own servants to go and bury Annie on the plantation grounds. Annie's grave is still there, next to the house. When they marked the grave, they put crosses on all sides except one. Apparently, they weren't sure if Annie's spirit was inside or outside of the grave, and they didn't want to make her angry by locking her out of her resting place. Rose Hall was left in ruins for many years, local residents were afraid to move into the Great House, remembering Annie's declaration that it was her house, and no one else would ever have possession of it. After many years, a couple bought it and planned to restore it for themselves. While they were moving in, a servant woman fell from the observation balcony Annie used for witnessing whippings, and broke her neck. The fall was considered very mysterious due to the waist-high railing that encircles it. No one knows why the servant woman was on the balcony, but many believe that she was somehow lured there by Annie's spirit, and pushed over the railing. Several years later, another couple bought the house. They carefully restored it and gave it to the Jamaican people as an historical landmark. It is now open for guided tours, and contains a gift shop. Jamaicans still believe it is haunted. Tours of the house end early so that all of the employees can leave before Annie's spirit comes out to wander. Many visitors report strange images appearing in their photographs. Some report the appearance of woman's face in the mirror in Annie's bedroom others have reported glowing or foggy areas appearing on the bed in Annie's room and sometimes in other areas of the house. Visitors have also reported that the film they used in certain rooms of the house would not develop, while the rest of the roll was fine. Others say that all the pictures they shot inside to house develop with a misty look, while outdoor photos are clear. Some of these mysterious photographs have been sent to Rose Hall and are displayed in the gift shop. Annie's ghost has been seen at night riding her horse around the plantation's grounds looking perhaps for runaway slaves. 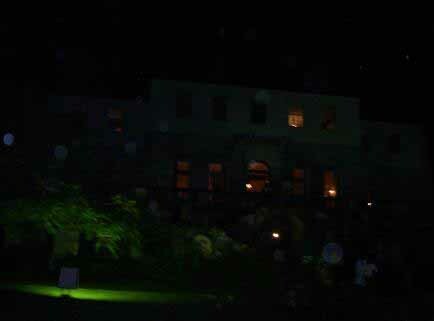 Her ghost has also been seen standing on the balcony overlooking the property. The most common place where Annie's ghost is seen is her bedroom, where she would kill her lovers. Underground tunnels that are said to be haunted run under the house and mysterious bloodstains are sometimes found throughout the house.